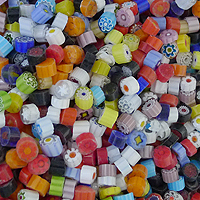 Millefiori beads get their names from the two Italian words: Mille, meaning thousand, and Fiori, meaning flowers. Millefiori style Murano glass beads are made with handmade glass canes, each containing an individual pattern of various design and color, from star to round to flower shape. Each cane made by placing the molten glass in a form, then adding layers of color and/or shapes, then drawing the cane out into a rod. These handmade canes cut into slices which are used by Venetian and Murano glass bead makers in their designs. Venetian Beads such of these have been made in Venice and Murano for hundreds of years and maintain their popularity. Millefiori Murano jewelry is wildly popular due to both its historical significance and its beautiful design. Widely copied by China and India bead makers, there is no substitute for the beauty of authentic Murano Glass worked in the tradition of centuries. It all begins with the clarify of the glass and resulting form. Venetian and Murano glass millefiori remains the finest in the world.